We recently reported that the Suspiria re-imagining was rumoured to be 2 hours and 30 minutes long, but today we can now confirm it. The film’s director Luca Guadagnino (Call Me By Your Name) has confirmed that the film will be a hefty 152 minutes long. Woah! Colour us even more intrigued. Remind yourself of the dazzling and terrifying trailer for the new take on Suspiria below. We think Dario Argento will be super intrigued; I certainly am. The trailer showcases exactly what a horror remake should be: completely different from the original, but still maintaining the spirit of what made Argentos’ feature so acclaimed. Like the original, there is a definite air of mystery and suspense, plus a clash between the genres of horror and drama. It’s early days, but this first footage is extremely exciting and promising. 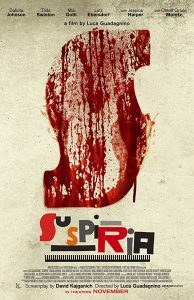 Suspiria stars Dakota Johnson, Tilda Swinton, Chloë Grace Moretz, Mia Goth, Sylvie Testud and Angela Winkler. The film will be released on 2nd November 2018, courtesy of Amazon Studios.